It may have been a day off for some on Monday, but not for the Walpole and Wellesley High School varsity girls hockey teams, who met at Babson Skating Center for their one and only meeting this 2018-2019 season. Thanks to some shutdown goaltending on both sides by Wellesley’s Liddy Schultz and Walpole’s Kiera McInerney, the teams were awarded a point apiece as the game concluded in a 1-1 tie. The Lady-Rebels (8-2-1, 4-2-1) killed off a pair of first period power play opportunities for Wellesley and the game remained scoreless entering the second. 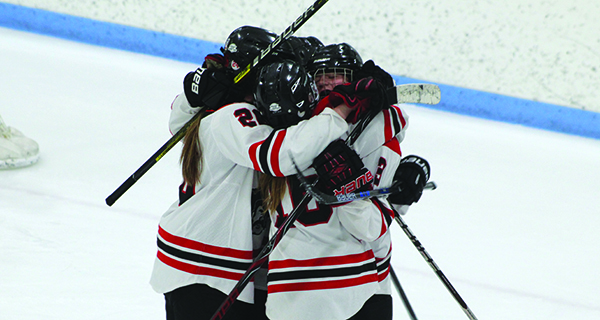 At 3:11, Emily Rourke broke through for Wellesley on the power play. Rourke dangled her way into the slot and ripped a wrist shot that was saved by the blocker of McInerney, but like all good goal scorers do, Rourke followed her shot to the front of the net and deposited home the rebound on her backhand to give the Lady-Raiders (6-2-2, 5-0-1) a 1-0 lead. Just over four minutes later, Walpole responded, also on the power play. Audra Tosone nearly evened the game at one when the senior captain/forward flew in on a mini-breakaway but was denied by the right post. However, Tosone would not be denied as she put home the rebound of a shot from the point by sophomore forward Emily DeSimone just moments later to even the score at one. Maja Desmond nearly gave Wellesley back the lead with time winding down in the period when the sophomore forward ripped a point-blank snap shot off of a loose puck in front, but a sprawling glove save by McInerney stonewalled Desmond’s scoring bid and kept the game tied at one at the second intermission. The third period brought out a conservative style in both teams, as neither side wanted to free up any ice and allow the go-ahead goal. Walpole killed off a Wellesley power play with 4:01 to play and neither team generated a significant scoring chance the rest of the way. The game ended in a 1-1 tie. 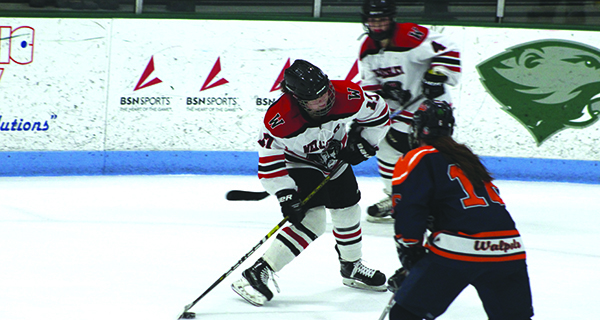 Wellesley returns to the ice on January 26 at Milton, while Walpole will square off with Framingham at Rodman Arena that same night.